I’ve been reading a lot of negative reviews of 2018 and I found them sort of depressing as they detailed how global warming is getting worse, the inability of people to have productive debates, and that technology is melting our brains. So, I’m writing my own, much cheerier year in review focused on our shop and the sheer amounts of cheese we’ve gone through. It’s been a pretty awesome year for our cheese consumption, especially for our numbero uno star of the shop, Aussie Magic. We went through 1459 pound of that tangy, salty, creamy magic! In other words, that is the weight of 1/3 of a rhino, or 15 toilets, or a mature Holstein cow, and it is enough cheese to fill about 3 bathtubs. Can you picture it now? Those were weird references, yes, but that much cheese is hard to wrap my head around without concrete examples. Lemme try another – we’ve sold 879 grilled cheeses this year, which, if stacked, would reach the top of a seven-story building! (I am responsible for approximately 107 of those sandwiches.) For catering, we made 211 platters this year, which would take us 5 40-hour weeks to finish, or if we worked straight 24 hours a day without stopping, it would take us almost 9 days. And then we would die. 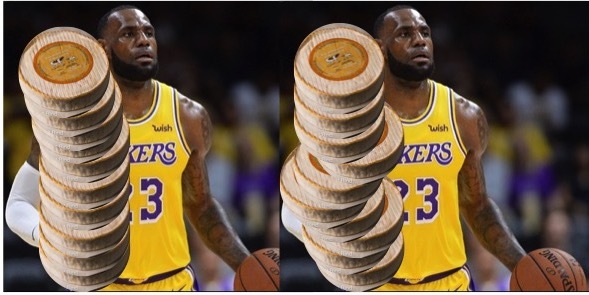 One more stat for the road – 586 pounds of the creamy, buttery, luscious Vacherousse d’Argental left our shop this year, which is the same weight as two LeBron Jameses each holding ten wheels of the cheese! Can you imagine 2 Lebron Jamses?? Even holding all that cheese, the two of them could probably beat most NBA teams. Except the Celtics #loyalty #goceltics. Thank you for helping us have a great 2018! Thank you for eating loads of cheese with us and for making our shop a happy place! Here’s to a joy filled and cheesy 2019!